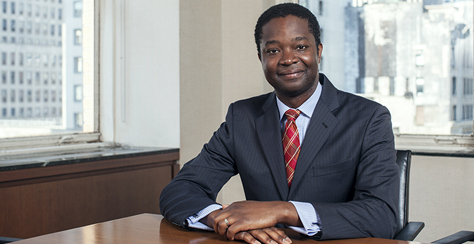 Arinze’s diverse transactional practice is focused on capital markets and private M&A. He has represented US and international issuers, funds, family offices, and financial institutions in a wide variety of public and private capital markets transactions, mergers and acquisitions, and general corporate governance, liability management, Investment Company Act issues and Securities and Exchange Commission reporting matters. His M&A experience includes advising on complex portfolio acquisitions, joint ventures, stock and asset purchases, mergers, private equity and venture capital investments and PIPEs. With an extensive background in capital market transactions, Arinze’s experience includes structuring and leading offerings of high-yield and convertible debt, secondary equity offerings, secured and unsecured credit facilities, Regulation D offerings, exchange offers, consent solicitations, and other public and private equity and debt offerings as well as seed investments in hedge fund, venture capital fund and private equity investment managers. Arinze advises domestic and international clients with respect to corporate governance and other securities law and corporate matters. Arinze was named a "Rising Star" by New York Super Lawyers in 2017. Representing large and medium sized hedge funds as lenders in various secured and unsecured debt transactions. Representing lending arm of a hedge fund with over $30 billion in AUM in connection with $125 million secured facility. Representing a family office as a lender in connection with $20 million accounts receivable based lending facilities. Representing venture capital funds with over $100 million in AUM with ongoing investments in U.S. and foreign portfolio companies. Representing issuers in connection with various public and private equity offerings. Representing investors in connection with equity investments in public and private companies. Advising on United States Investment Company Act of 1940 matters in connection with securitizations and credit facilities. Representing a hedge fund with over $30 billion in AUM in connection with acquisitions of portfolios of venture capital funds. Representing a hedge fund with over $30 billion in AUM in connection with investments in portfolio companies. Representing investment managers in connection with seeding investments. Representing a hedge fund in connection with entering into and exiting real estate joint ventures. *Work on this matter was performed while practicing at a prior firm.